H x W: 13.5 in. / 18 in. Artist James Sessions was a master watercolorist, probably best known as a painter of marine subjects, from the Bahamas and New England’s fishing harbors, to the fishing grounds of Nova Scotia. He also painted scenes of the Navajo reservations in New Mexico. Sessions is also considered to be the greatest "brush reporter" of World War II. His works can be found in Presidential collections, numerous important corporate collections and military institutions throughout the country. 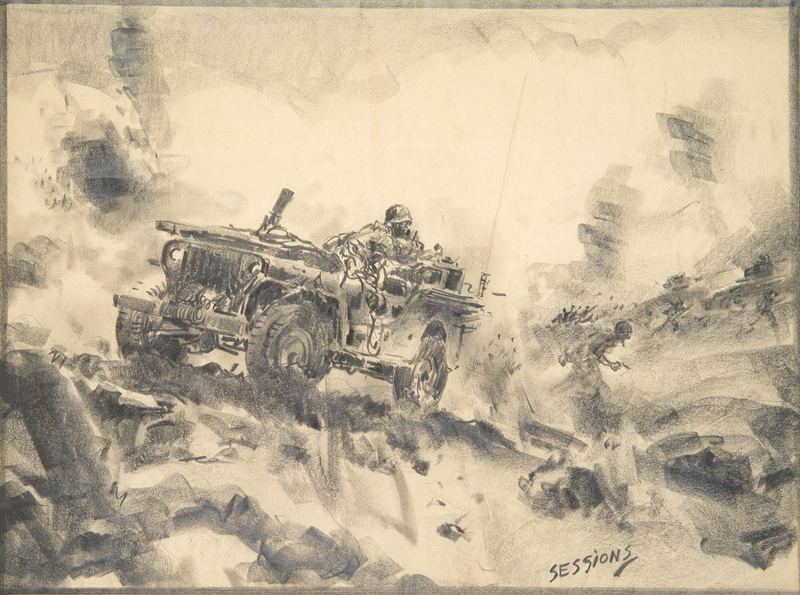 His works document important World War II historical events, conveying the spirit of the American fighting forces in both the Pacific and European campaigns as few artists ever captured. He depicted many events—most for the Chicago Tribune—including the bombing of Pearl Harbor, the D-Day invasion, phases of the Pacific war, including Jimmy Doolittle's 1942 daylight bombing raids of the Japanese mainland and the unconditional surrender of the Japanese military. The details of this scene, while loose and impressionistic, are highly accurate, lending to the drawing’s visceral sense of realism. The Willys MB (jeep) is true to life, beat up but still operational; dust kicks up in its wake as it rattles over the grassy, rock-strewn, and potholed terrain. It clouds the view of the soldiers in the background, whose forms come in and out of the smoke and the dust. While it was not drawn from life, the energy and immediacy of Sessions’ line work puts the viewer at the very center of the action. Throughout the war Sessions also created numerous wartime advertisements. Examples include a 1943 Willys Jeep ad showing the Coast Guard at Guadalcanal, and a Borg-Warner ad in 1945 showing the mass production of radiators and clutches for motorized warfare manufactured in Detroit. Sessions served in the Illinois Naval Reserve during World War I.